In my initial post I concluded that I've yet to find a good bourbon/rye bar in Phoenix, and only a few good scotch bars. Well, I'd be remiss to not review Seamus McCaffrey's which has (at least per their website) the largest selection of scotch in all of Arizona. 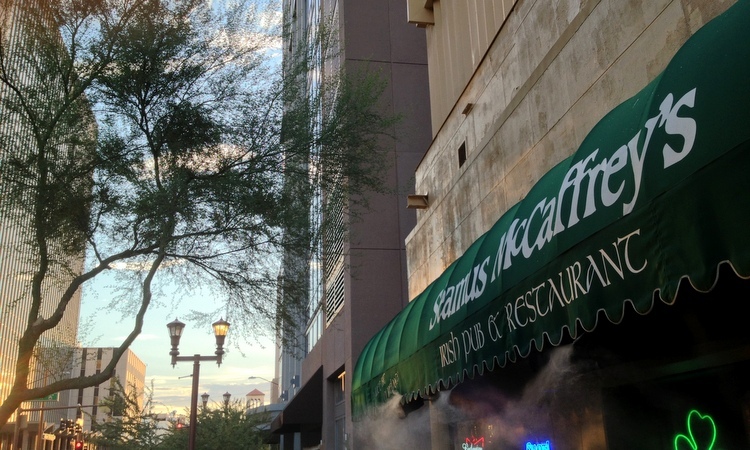 Seamus McCaffrey's has been in the same location in downtown Phoenix, partly occupying the first floor of the historic Hotel San Carlos, for 22 years (per my server). They indeed have a substantial selection of whisky, but be warned, the prices currently listed on the website are way off from what you'll actually find in the bar. Many, like the Aberlour A'Bunadh I sampled, are only a dollar or so off. Others, like say, a Macallan 30, are a whopping $50 different (from $50 on the website, to $100 on the menu at the bar). I was pleasantly surprised to see, in addition to their extensive scotch selection, a decent (not great, mind you) selection of bourbons and ryes. But, as I was in an Irish pub it only seemed right to drink scotch. In addition to the A'Bunadh listed above I also had a Laphroaig 10. As the A'Bunadh is a single-barrel, cask-strength scotch, which barrel it came from matters. When I prefaced that I was about to ask a technical question about this particular scotch, my server replied, "I probably won't know...they don't train us on that." She was more helpful when I pointed out that this information would likely be listed on the bottle. She returned and informed me that I had a pour from Batch 41, which is 118 proof (the lowest of any batch since 1999). Color: Hard to tell in the darkness of Seamus McCaffrey's, but I'm going to go with reddish brown. Nose: Fruity -- specifically red apples. Surprisingly little alcohol on the nose given its high ABV. There was also a little bit of smoke in the back, but significantly less than in most scotches I've had. Palate: This is one of the fruitiest scotches I've had. Lots of apples, apricots, and cherries, followed by a little bit of wood and medicinal flavor. As with the nose, it is remarkably smooth for being 118 proof. Finish: Sweet fruit, followed by a bitter-sweet flavor I can't put my finger on, and then, again, a some wood. Overall: 8.0 out of 10. Very good. If given the choice between a high-quality bourbon and a high-quality scotch, I'll almost always go with the bourbon. Yet, for an admittedly silly reason (which truthfully affects my impression of it) the Laphroaig 10 is one exception. I can't help, as I'm drinking my Laphroaig, imagining an old Scotsman, walking along a boggy shoreline on the island he lives on in Scotland. As he's walking he's being buffeted by wind and rain, at times falling in the mud and peat. Finally, he comes across an old pub where he takes shelter. What does he order in the pub? What else...a Laphroaig 10. I don't know how anyone's mind can conjure up anything else as he's drinking it. Without that image, this beverage is such an oddity I'm not sure why anyone would drink it (as with other islays as well); with it, it is a very enjoyable experience. Nose: Peat and smoke. Nothing else. If you hear or read anyone else say that they smell something else (fruit, lilacs, etc.) he's lying. Palate: Peat, smoke, and wood. Buried beneath a deep layer of those three, there may be some pleasant medicinal and otherwise earthy flavors, but those are fleeting in the onslaught of peat. Finish: More of the same. There is a sweeter flavor on the finish than anywhere else. Overall: 9 out of 10 -- with imagery described above; 3 out of 10 without it. You have to try it at least once. Of note, I like the Laphroaig 18 less than the 10. I feel like it softens some of the incredible peat-punch-in-the-face the 10 offers. If you genuinely enjoy the flavor of the 10, but feel that it's too edgy the 18 is probably worth a try.